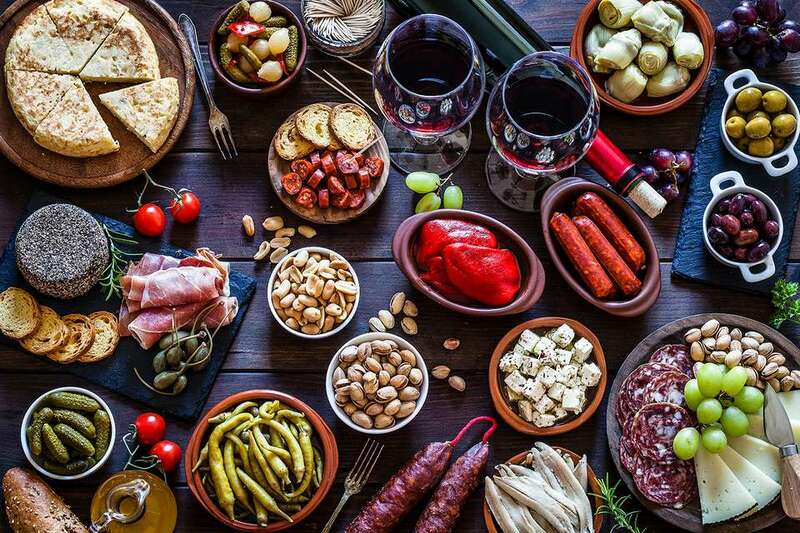 Tapas are simply a part of life in Spain and they've gained popularity all around the world. Though they're considered Spain's version of appetizers, tapas are eaten any time—day or night. Going out to eat tapas is such a big part of the culture that there is even a verb tapear which means "to eat tapas." Put a few of these little dishes together and they can make a meal on their own. Here are 10 recipes you can recreate at home—don't forget the sangria. 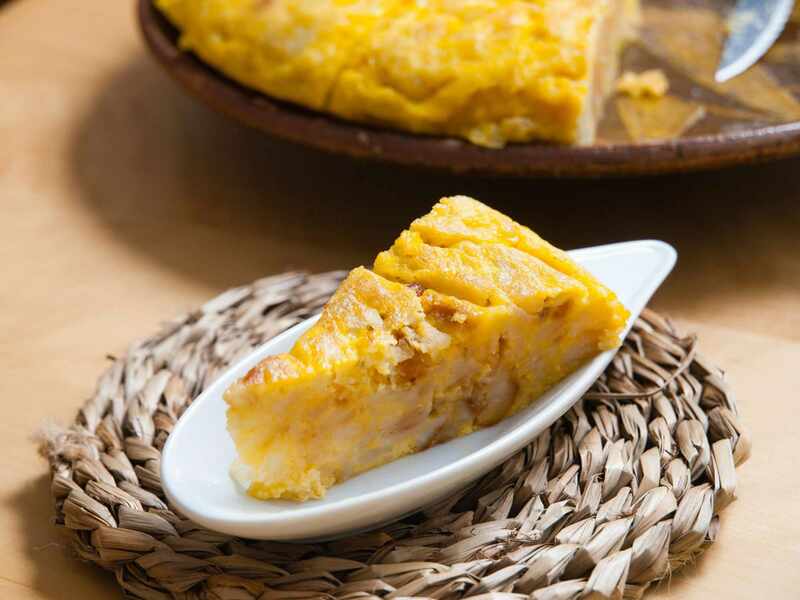 Bars and cafés throughout Spain serve this potato and egg strata as a meal starter, but it's also often eaten as a light dinner in Spanish homes. Tortilla españ​ola is portable as well, and many turn it into a sandwich by placing a piece between two pieces of a baguette. Croquetas de jamón (ham croquettes) are a staple of the Spanish tapas scene. You can make them at home with Spanish cured ham. Enjoy them as an afternoon snack or with a glass of beer or wine as they would in Spain. Both the dough and the croquettes can be made ahead and frozen—quite handy when you need a snack or have last-minute guests coming over. Patatas Bravas is a classic Spanish tapas dish featuring spicy potatoes. Legend has it that the dish was invented at a bar called Las Bravas in Madrid and you'll find variations throughout the country. The bravas sauce should have a bit of a kick, and this version gets it from Tabasco. Empanadillas Gallegas, a meat or tuna-filled turnover, is the most popular dish from Galicia, a coastal area in the northwest of Spain. Empanadas are typically large and round and cut into pieces to serve; here, you'll make individual tapas-sized versions called empanadillas. Gambas al ajillo (garlic shrimp) is a one of the most beloved tapas in all of Spain. You'll want lots of garlic, excellent Spanish olive oil, dried cayenne pepper, paprika, a splash of brandy, and—of course—fresh shrimp. Basque cuisine takes advantage of the seafood along Spain's northern coast. These clams in parsley green sauce, or almejas en salsa verde in Spanish, is a typical Basque specialty. Enjoy it with the Txakoli, a light white wine from the region. Pulpo Gallego is Galician-style grilled octopus. Served all over Spain, this dish is incredibly simple, calling for slices of grilled octopus served with boiled potatoes, olive oil, and sweet Spanish paprika. It's typically set on a platter with toothpicks for you to spear and enjoy with beer or wine. Pimientos rellenos ​de atun (stuffed red peppers with tuna) is a great dish for the summer since no cooking is required. Mix tuna with a bit of green onion and olives, then stuff into canned roasted red peppers. Banderillas gets its name from the barbed darts used during a bullfight. You won't have to do any cooking for this starter either. Instead, you'll employ your artistic talents to create a colorful skewer of the ingredients.